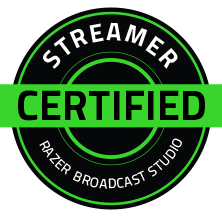 Razer is here for you whether you are new to streaming or have been doing it for years. Sites like Twitch, Youtube and Mixer are blowing up with gaming content. In one year on Twitch alone there were 241,441,823,059 total minutes of people streaming. That’s well over 450 years of time! There was an average of 1.7 million streamers monthly. That’s a lot, no bones about it. What do you do if you want to become a streamer and set yourself apart from the 1.7 million others? Use quality gear! Whilst I can not teach you how to game, or show you how to have a great personality, what I can do for you is help you gear up! Nobody wants to watch a poor quality stream, there is just too much other content out there and if you aren’t streaming with decent hardware you’ll have a hard time keeping viewers. Razer has got you covered though! Late 2017 they dropped two amazing pieces of hardware that will elevate your streaming capabilities whether you are brand new, or just in the market to upgrade. 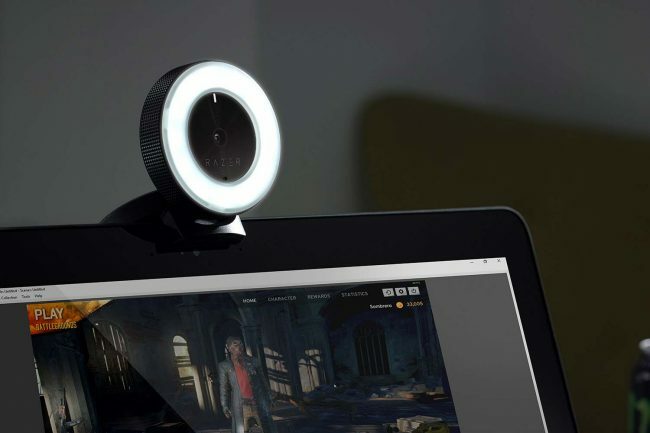 The Razer Kiyo is Razer’s self-illuminating webcam, and Razer’s Seiren X is their newest USB Condensor mic. The Razer Kiyo is a well constructed, webcam with features not found on most. We all stream from different places, some are a streamer’s paradise where the lighting is always perfect, while some stream from an office or their bedroom late at night. For the latter, the built-in light will make you look good regardless of the situation you are streaming in. With the ability to adjust the light it is never too bright and always just enough. You simply plug the camera in via USB, load it’s driver and you are ready to go. No special hardware is needed. The light itself acts as a dial so you can always turn it up, and turn it down as need be. The Razer Kiyo make any streamer, including myself look great! The Razer Kiyo records in 720p Resolution at 60 FPS, and 1080 HD resolution at 60 Frames per second. You don’t have to worry about your stream lagging, and not being able to keep up with this thoughtful camera. 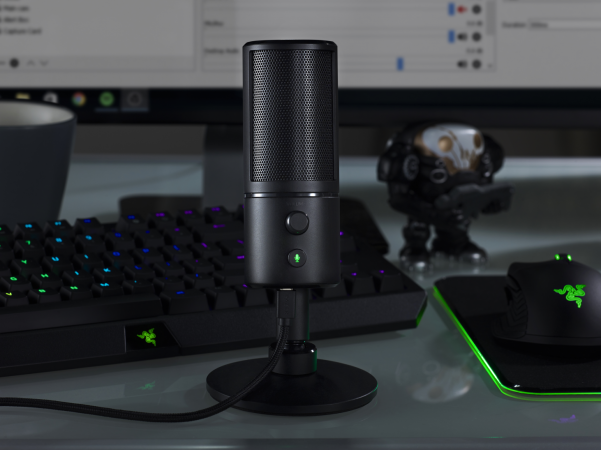 The Razer Seiren X is Razer’s newest USB condenser mic. It is constructed to be taken on the road with you, but don’t let that stop you from using this microphone as your regular streaming mic. Using what is called a supercardioid pickup pattern, this mic is able to pick up what is being said clearly, without picking up all that background noise. If you are an avid streamer, you know that there is an incredible amount of noise that you by nature just tune out because it’s become ambient. Your viewers; however, are not tuned out of all your noise and this can make a problem for any streamer. Whether it’s your computer’s fan blowing too loud, or even your mechanical keyboard presses echoing through the mic it unwanted noise on the viewers end. The Seiren X is able to filter out a lot of that nonsense do you don’t have to worry about it. Yes, if you smash on your keyboard your viewers will hear it, how about you just don’t do that…okay? The slim design of the Seiren X not only makes it portable but much less intrusive while you are gaming. In the heat of the moment, you don’t want to a giant microphone in your way. You are not going to get that Chicken Dinner in PUBG if you reach for something and hit your mic instead. The microphone itself features a typical volume control knob and a mute button. Please for the love of God mute your mic before yelling at someone 2 rooms away. It is loud, it is unprofessional and it can easily be avoided. Also on the mic is a 3.5mm out so you can plug your headphones right into it to monitor your sound with no latency. Pretty neat, right? Overall I am in love with these new Razer products. Razer is no longer just known for their Gaming Mouses and Keyboards. They are known for all things gaming and the Seiren X and Kiyo compliment this sentiment nicely. Both pieces are priced very fairly under a hundred bucks each directly from Razer. You can pick up the Seiren X by clicking here and the Kiyo by clicking here. I assure you, these pieces will complement any streamer gamer or not!